About ten years ago, Jon Schmidt — who lives in Philadelphia — took a business trip to Boston, working out of his company’s new Boston office. One day, sitting at his desk, Jon noticed a piece of paper curling out from behind the vertical blinds. It turns out that years earlier, the company that Jon’s twin brother, Jeff, worked for had leased the same office space. As a prank, Jeff’s co-workers had planted his photo on the back of the vertical blinds, and no one had removed the picture when the company moved out. 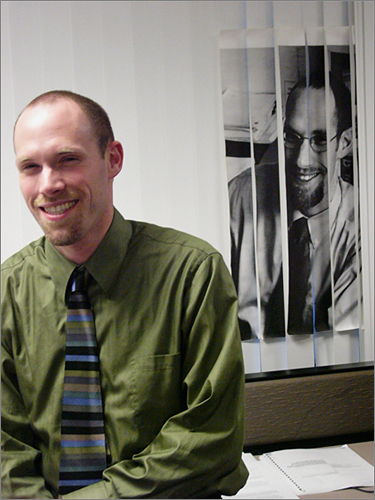 Jon was working in his twin brother’s same building, in the same office, at the same desk, with a life-sized picture of his brother on the back of the blinds. I doubted it was anything, but I told him to bring it in. And there’s us! 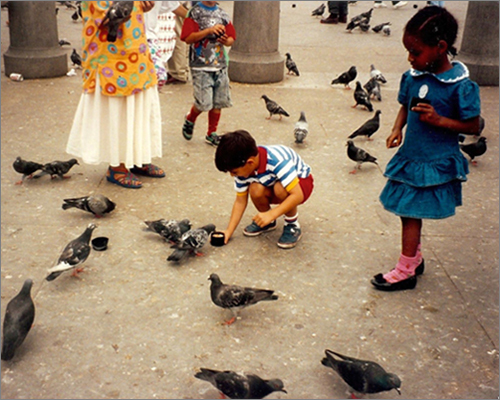 I was 5, he was 6, and we were feeding pigeons together in Trafalgar Square. He lived in Houston at the time and I lived in Louisiana. We became friends about ten years later, after my family moved to Texas. 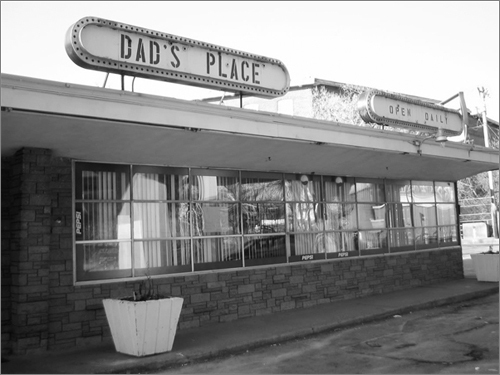 The last time Victoria saw her dad was over breakfast at Earnshaw’s Diner in Fall River, Massachusetts. About a month later, over Easter weekend, he suddenly died. When Victoria drove past Earnshaw’s that summer, the name had changed. The new name? On a trip to California, Michael bought three shirts and a pair of shorts from a second-hand store. 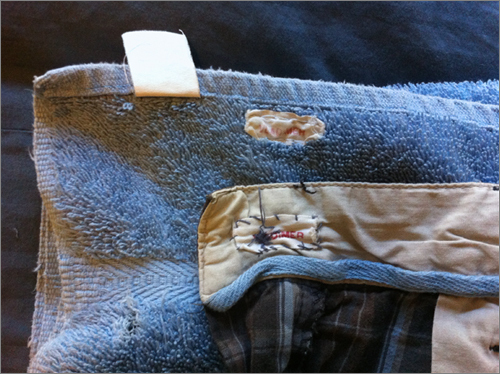 Months later, he was putting the shorts on when he noticed a label sewn into the waistband. The label was his own last name. 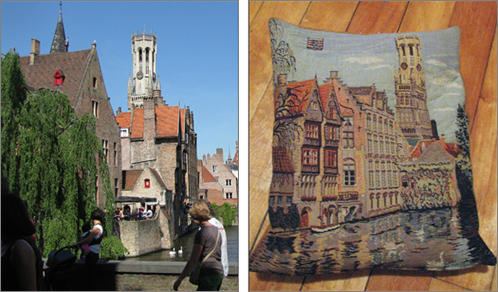 And it looked familiar. “When I was 15, I went to sleep-away camp,” Michael explains, “and my mother had sewn those tags into all of my clothing. I recognized the tag immediately because I still had a towel with the same tag.” He compared the tags on the towel and the shorts and they were identical. The thing was, Michael had grown up in New Jersey. “Somehow they made it from New Jersey to Los Angeles so that I could buy them again.” says Michael. Will The Real Bill Howard Please Stand Up? In May 1998 I was on my way home from my freshman year at Taylor University and was driving through Kokomo, Indiana. 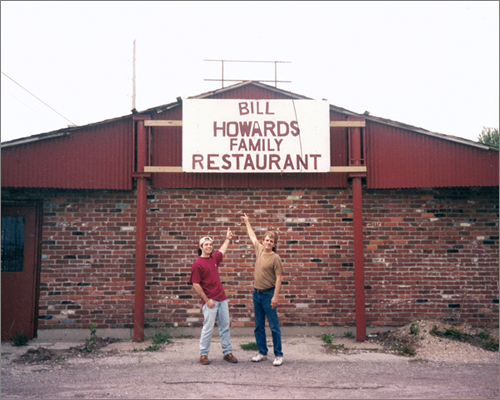 I had heard there was a restaurant there named Bill Howard's Family Restaurant. Since my name is Bill Howard I was curious and wanted to find it. About 9am I pulled up to a pretty run-down brick building. The sign was a piece of plywood painted white with red stencil letters. Me: Well who's Bill Howard? Me: My name's Bill Howard, too! Guy: (gets all excited) You're shittin' me! He gets his friend and we go out to the parking lot to take pictures (see attached!). He's so excited. And maybe drunk? His friend had a video camera and I remember him saying while he was taping, "Mom and Dad, this is Bill Howard!" Guy: Well we're closed now, but come back anytime for a free drink. Me: Thanks! I actually won't be around for a while because I'm on my way home from college for the summer. Guy: (gets even more excited) You're shittin’ me! I used to live up there! Guy: Do you know the cowboy Bill Howard? Me: No. But do you know my Grandpa? His name was Bill Howard, too! Guy: Don't think so. What's your middle name? Guy: (Still super excited) You're shittin' me! Guy: I don't have one. My mom never gave me one. Stephanie Foo killed a snowy owl — with her car — driving in Big Sur, California. It was stuck on her grill. She’d never seen an owl before. 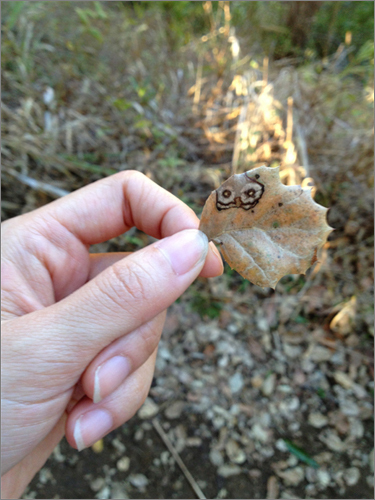 The next day, she saw a guy selling owl t-shirts, went on a hike and saw an owl sticker in the middle of the woods, and a leaf with an owl face on it. Later, an owl flew next to the car on the highway, hovered next to the passenger window, and turned its head to look at Stephanie's boyfriend. Stephanie slowed down, not wanting to hit another owl, and the owl slowed down too. Afterward, she looked up what owls represent and apparently it’s wisdom or doom. Her boyfriend got fired that week. Evan and Bryan grew up in Appleton, Wisconsin. They weren’t friends growing up — they didn’t go to the same schools — but they did go to the same church, where they eventually ended up meeting, and later, falling in love. 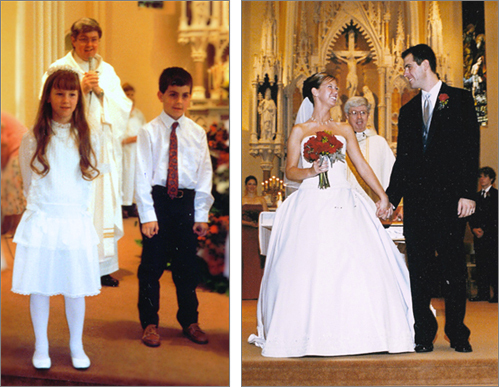 One day, flipping through an old photo album, they realized they’d made their First Communions at the same mass. They now have two photos that mirror each other: same kids, same place, same priest, different dress.